A simple-to-use smart thermostat system that comes with a touchscreen controller and works with the Lyric app. It is also Apple HomeKit enabled and allows geofencing to ensure that heating is only on when people are home. Smart heating systems are on the up. And having moved into a new home recently it made a lot of sense to test Honeywell's latest smart home thermostat system, the Lyric T6. We had the Lyric T6R fitted, which is the same as the standard T6 but comes with a freestanding, wireless thermostat which you can take around the home rather than the hard-wired, mounted solution. The T6 system is designed to be simple-to-use and, via a professional installer, easy to fit into the home. 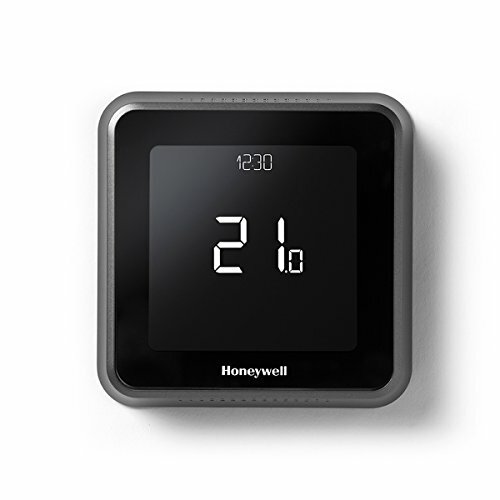 The real question - especially with the variety of smart heating solutions such as Nest, Tado and Hive, all of which can learn and predict your heating patterns - is whether the Honeywell solution will leave us looking to upgrade to something more comprehensive later down the line? The T6R needs a power cable plugged in so isn't as wireless as other, battery-operated solutions on the market. However, at least that means there's no danger of you getting home and finding it inoperable – it even has some internal battery power as back-up in the case of a power cut. Both versions of the Lyric system come with a receiver, which is the bit you'll need an installer to fix. It is not recommended you install this part yourself unless you are a qualified electrician or heating engineer, and it's lucky we didn't take on that role ourselves, even though we have a basic understanding of what to do. That's because our installer discovered that the previous thermostat, which was installed before we moved in, wasn't actually connected to our heating programmer at all. It didn't work. The previous owners might have thought it did. It didn't. It couldn't. And it wasn't. Worse still, the previous installer had left the wiring in a state, with nonsensical connections and incorrect colour configurations. Our Honeywell installer didn't seem surprised, so it seems a common issue. Thankfully, he made short work of completely rewiring the entire system and ensuring that the new receiver operated the heating valve on the hot water tank – as it should. The programmer still controls our hot water, as the Lyric receiver can't control this - only be in charge of heating. It basically opens the valve when necessary. The rest of the magic is done by the thermostat. The wireless 'stat can be placed anywhere in the home, but works best in a room that adequately represents the average temperature. Otherwise it won't accurately reflect real temperatures. Alternatively, place it in the room you use the most, as that's the one you'll want to heat more often. Like other thermostats, the Lyric T6R takes the ambient temperature of its surroundings and judges whether you need to switch the heating on or off to maintain your chosen level. It is touchscreen and simple to use, with plus and minus buttons allowing you to increase or decrease the optimal temperature just by tapping them. There are also settings to adjust the Wi-Fi connection, set any schedule options, change time settings and so on. You can also turn off the system or your home settings from the front screen. Where the Lyric system comes into its own, however, is with the use of an accompanying iOS or Android device, via a downloadable app. The Honeywell Lyric app is simpler thn the company's Evohome system, but it is still very effective. You get a bottom wheel to set the temperature and readings for the current temperature and how chilly or hot it is on the outside of your home – presumably taken from a web weather service. You also get a button to set a home schedule, which can determine how warm you want the house or flat to be when you are at home or away, or when you are asleep. By setting sleep timings, say 23:00 to 06:00, you can tell the system to switch off entirely or drop to a more comfortable level – such as 16-degrees. When you are home, that can be set at 20-degrees or such like. That way, the system always knows that while you are indoors, it should maintain that constant heat, apart from when you traditionally go to sleep. And it works well (depending on the quality of your individual radiators, etc). You can manually override these settings whenever you like, using the on-screen wheel or buttons on the thermostat, but it's a way of very simply setting schedules. You can also introduce schedules that change depending on the day – such as different schedules for weekdays or the weekend. Like many smart heating systems the Lyric T6 system also allows you to set geofence control. This radius on a map around your property will, should you be outside the circle (as tracked by your mobile phone), set a separate "away" temperature. Not only will this save you money by automatically reducing heating when you're not at home, but it can ensure your home is toasty again just in time for you to set foot back in the door. That's because it detects when you've re-entered the geofence, through your phone's location, and goes back to your at-home settings. And as you can expand or reduce the circular zone, you can time it to your preference. You can also invite the family to have control through the app, to ensure the heating won't switch off if your partner has a work-at-home day and you don't. Once installed on a device the Manage Users option gives every member the same level of control as long as they have been invited originally – and there's the option to remove users, which is useful, say, if you have guests. The Honeywell Lyric T6R system is also compatible with Apple HomeKit, so you can control your heating through supported devices, such as Apple TV, or use Siri to interact with it using voice commands. Amazon Alexa support is apparently in the pipeline too. This particular Honeywell system is fairly feature-free in comparison with others in the company's line-up - there's no zone control as with Evohome, for example. But therein lies Lyric's very attraction - it is simple to understand and to use. It is the brand's rival to Tado, Nest and Hive, and is a quality rival to them all. Just because the Honeywell doesn't try to learn your heating pattern doesn't bother us - we've had other members of the team constantly try to correct Nest, for example, for whacking up the heating when it wasn't necessary. The T6R version, with wireless connectivity, is handy so you can move the thermostat from room to room as needed. But we'd just as happily wallmount the static T6 version. Having the choice between products is great to suit different needs. As smart heating systems go the Lyric might read as a little more basic than some competitors, but it does exactly what we want from a smart heating system without over-complicating things - so no need for us to upgrade any time soon. Honeywell has always been a leader in effective home heating and that shines through in the Lyric system. Sticking with the same brand, Honeywell's top-end system - which is an entirely different prospect - allows for zoned control with individual rdiator caps. If you want the living room to be 20C and the baby's bedroom to be 22C, for example, then that's possible with this more comprehensive system. Perhaps the best recognised of all smart heating solutions, Nest is a solid option. Like the Lyric it knows your and your family's whereabouts and will switch the heating on accordingly. It will also learn heating patterns and auto-schedule these for you. Of all the heating systems Nest is by far the best looking one we've seen. Now you don't need to be a British Gas customer to use Hive. The smart home setup is now wider than just a smart thermostat too: there's also lights, sensors and plugs which you can control all from the one app. Even though it lacks individual room or zone controls, Tado otherwise does exactly what it sets out to do: intelligently controlling your heating based on your location to home. If you have a hot water programmer then it can handle this too - which is a one-up compared to most of the competition.